Molissa Fenley must be a captivating conversationalist. I‘ve never spoken to her, but it’s the way her choreography speaks to me that leads to the thought. Her language is vivid and intelligent, yet never too intellectual for a wink. Movements -- her words-- emerge (seemingly from one idea) and carry us off so easily into entrancing tangents that we barely know what’s happened until it’s over. For one and one-half hours last Tuesday, September 16th, during a one-night-only concert at Judson Memorial Church, I eagerly followed Fenley and her quartet of accomplished dancers through ensemble dance works that premièred in different countries and time periods--from Tokyo in 1985; to Genoa in 2013; to New York City, Judson Church, that very performance night. Esperanto, the last work of the evening, choreographed in 1985, relentlessly juggled patterns, vocabulary and atmospheres. The most energetic of the evening’s pieces, it burst forth into Judson Church’s sanctuary, springing towards the audience with the driving electronic burps and beats in the score by Ryuichi Sakamoto. Evan Flood, Christiana Axelsen, Rebecca Chaleff and Matthew Roberts in bright tight outfits of blueberry, rust, wine, and emerald, respectively, ate up the floor with open-armed spins and rapid footwork. They chomped at the air with leaps and turning walks that became flying leaps. Trying to write down the individual steps, which I did try for fun, was fruitless as the steps occurred with mighty speed and abrupt shifts. Keeping track of the groupings of dancers was even more difficult. A jubilant quartet became a trio playing with a soloist, which then became two couples (or was it was a duet with two solos?) then four solos, and so on. While I “knew” all the dancers were in the same room, there were moments when I doubted it. They seemed to have individually wandered off to visit different alcoves, perhaps other countries. At times, I wasn’t sure where I was or what I was listening to (Sakamoto’s score traveled too, from disco beats to warbled conversation from blaring sirens to symphonies) Still, it was the most stimulating and absorbing confusion I’ve encountered in a long time. Fenley’s more recent pieces were quieter but nonetheless filled with abundant detail. 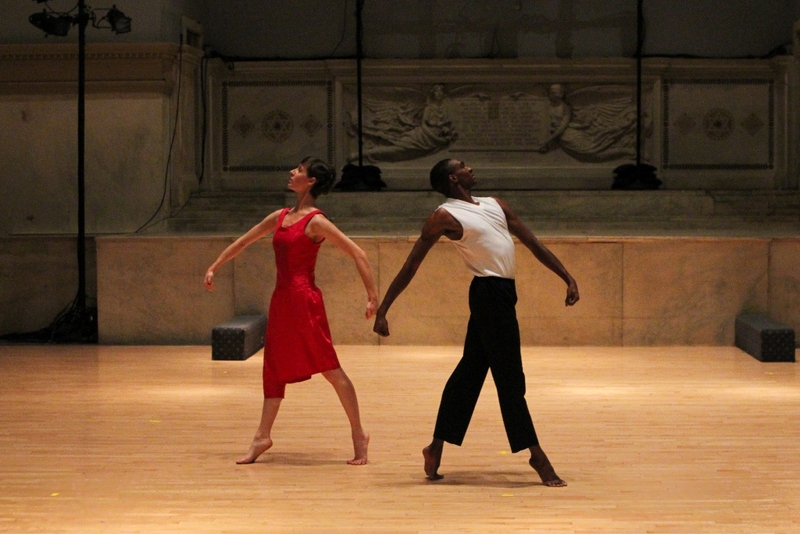 Dance An Impossible Space (2013) began as a luxurious duet with Fenley and Chaleff, then expanded into a trio including Axelsen. Donned in simple, but elegant, sand-colored, linen jacket mini-dresses and white-pink tights, the trio moved decisively, talking to one another through shape and gesture. They exquisitely connected lines and curves in the air and on the floor, all while moving to haunting vocal music composed and performed live by Erin Gee. Gee, alternating between two microphones, one for guttural sounds and the other for ethereal whispers and coos, seemed a modern day siren, her enchanted music breathing life into the dancers, impelling their actions and rendering them into post-modern muses. Redwood Park, a refreshing, meditative quartet which began the evening, was divided into two segments. (Part I) premiered in May of this year and (Part II) debuted the evening I attended at Judson. After a casual walking entrance from the backstairs of sanctuary, two women, Axelsen and Chaleff, in shimmering peach and raspberry half-dress/half-pant outfits, and two men, Flood and Roberts, in classic white T-shirts and black pants, fluctuated from balletic hovering turns to still poses evocative of Greek friezes. Lofty “almost” barrel turns found the dancers changing course in the air, discovering new directions, then facing us head on with impish shuffles of their hips before matter of factly moving on. (Part II) saw the dancers as statues coming to life. Imagine the architectural figurines in a beautiful garden waking up, not only appreciating the fact that they can breathe, but also relishing the experience of falling off their pedestals at last. Here one of my favorite movers was Christiana Axelsen who,as she fell into and out of alluring shapes with her partner, shivered with wildness. Fenley’s vocabulary ranges from a celebration of long lines — luscious arabesques and sweeping side kicks — to minute waves of palms that answer the beckoning of music. We notice fluid serpentine arms that swim around a beautifully straight body (reminiscent of a Flamenco dancer) and punctuated skitters and thrusts of the chest, feet, knees, and hips that electrify us with their rhythmic twists. Then, every so often, within the classical sophistication, a movement reminding us of a muscle man boasting his brawn proves Fenley’s playfulness. There is an old dance rumor that says the post-moderns only perform from the neck down, but not here. While the dancers don't narrate a story, or portray specific characters, they are not afraid to show us their pure enjoyment in action, and there is so much action to enjoy.